Microfilm of originals in the Diocese of Fort Wayne-South Bend in Fort Wayne, Indiana. Pastoral Minister: Sr. M. Anthony Kubat, C.S.S.F. Principal: Sr. Dian Majsterek, S.S.J.-T.O.S.F. Holy Day  8 a.m. (English), 7 p.m. (Spanish); Vigil/Holy Day  5 p.m. Weekday  M, W, F, Sat. 8 a.m.
Reconciliation: Saturday  8:30, 10 a.m.
On August 7, 1905 the St. Adalbert Fraternal Aid Society was officially organized. The new parish was to be named after St. Adalbert, Bishop and Martyr, with the settlement called Krakow. This group of dedicated organizers made house to house collections to purchase land for the church and school building. The nickels and dimes amounted over a period of time until $402.10 was collected to purchase two lots on Warren and Huron Streets. It was decided through the advice of Rev. Valentine Czyzewski, to purchase land on Olive between Huron and Grace in 1907as the site of construction. By the fall of 1909, the foundation for the building was laid and the present school had its beginning. Funds for the completion of the structure were not readily available, and nearly $8,000 was needed to finish the project. Rev. Czyzewski spear- headed the house-to-house collection, took a census to establish the membership of the new parish, provided spiritual guidance and was the temporary director of organizing the parish. The most Rev. Bishop Alderling was approached to appoint a new pastor and he answered the call of the flock. The first pastor, Rev John Kubacki, arrived on July 2, 1910 and was touched by the warm welcome of his parishioners. South Bend at that time was the largest city in Northern Indiana, attracting many immigrants to the area. With great energy, Rev Kubacki seized the chance to organize several parish societies and began administering to the parishioners spiritual needs while members of the parish began collecting for the new parish. Soon thereafter the cornerstone was dedicated on Sunday, September 4. 1910 by the most Rev. Bishop Paul Rhode, the first Polish Bishop in the United States. 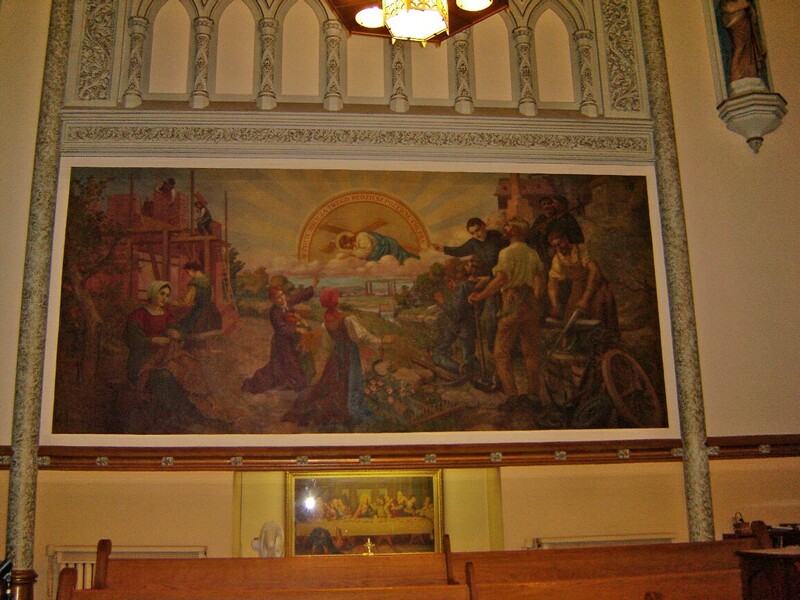 The first mass was celebrated on October 16, 1910 in the open air, upon special permission for all parishioners to attend, between the two walls of the new church by Rev Kubacki. Under the leadership of Rev Kubacki, the men and women voluntarily continued to erect the new Church - Parish School building. The entire building later became the present Parish School and Heritage Center. 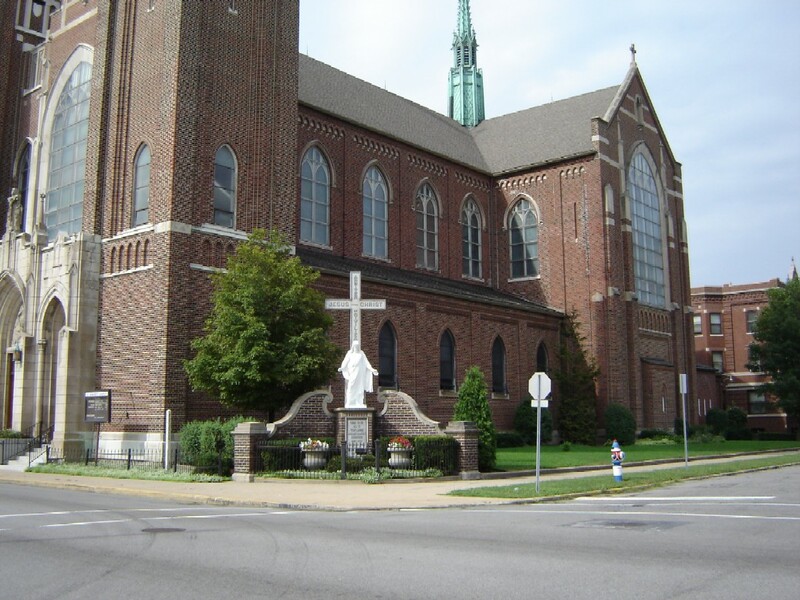 The Church School was dedicated on September 4, 1911, and the Felician Sisters from Detroit, Michigan opened and staffed the school that same September. The Rev. John Wroblewski was the first resident assistant coming to St Adalberts on June 23, 1912. The three original church bells were also installed that same year. The Christ statue was dedicated on the occasion of Rev. Kubackis Silver Jubilee on June 19, 1919. Under Rev Kubacki several assistants served the parish. In 1913, Rev John Tarlowski replaced Father Wroblewski. In June of 1915 the present rectory was completed and accommodated the following assistants during that period: Rev Herek, Rev Vincent Rozmus, Rev. John Mard and Theophil Chemma. 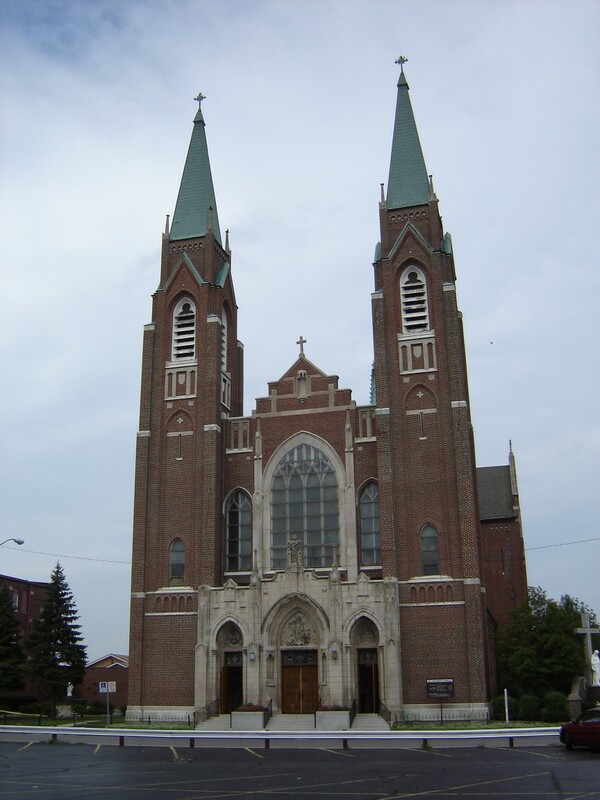 The new parish also had its share of those entering the priesthood with Rev John Wroblewski being ordained in 1912 and Rev Michael Gadacz in 1917. The next Pastor was Rev John W Osadnik who took over the pastorship on February 7, 1920. His main forte was being responsible for so many souls and he concerned himself at all times with making them conscious of daily progress in Christian virtue. 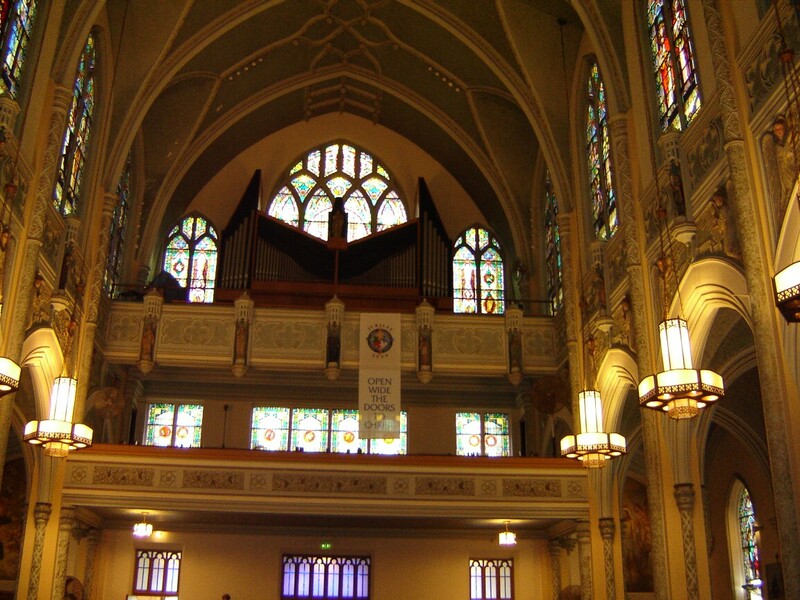 Bernice Klug became the first parish organist in 1920. Rev Osadnik decided soon after he became pastor that the Church School building was inadequate as a church and school, Therefore a parish meeting was held in 1923 to discuss the renovation of the original building for a school and the erection of a new church. The official laying and dedication of the cornerstone for the new church took place on July 29, 1923. Due to lack of funds, the work began but proceeded slowly. This was but another example of the continued struggle of the parishioners spurred on by a fervent pastor. The new church, considered the largest and most beautiful in the Diocese was completed in spring of 1926 at a cost of $23,000 and was blessed by Bishop John Noll. Rev. Aloysius Jarka and Rev. John Biernacki served as assistants at that time. In May of 1931, a temporary parish hall was erected due to the fact that the depression caused deep financial stress. 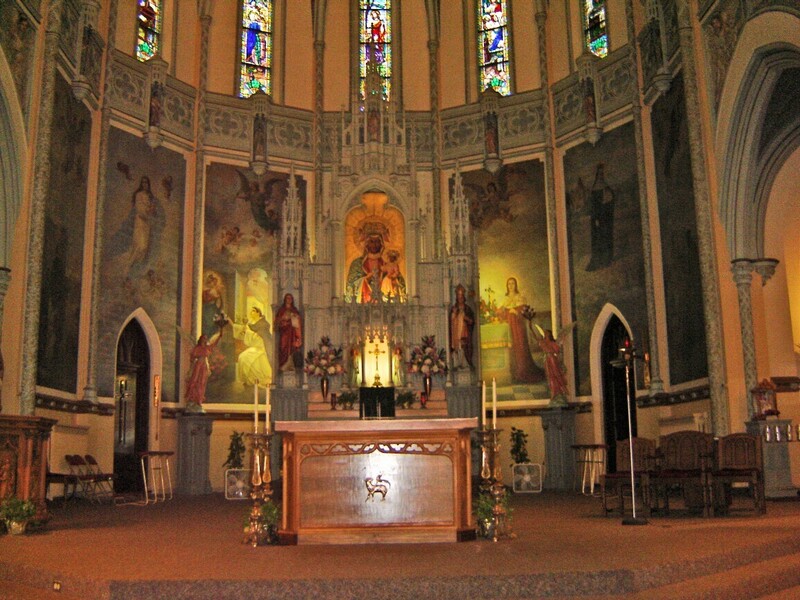 The Parish celebrated its Silver Jubilee on Sunday, October 20, 1935. Now a Monsignor, Rev. Osadnik retired on January 23, 1940. He was followed by Rev. Aloysius Jarka appointed by Bishop Noll. Due to illness Rev. Jarkas pastorship was short and he passed on September 20, 1943. Another memorable event took place during this era as Rev. Louis Ratajczak became the first parishioner to be ordained on May 26, 1923 by Bishop Aldering. Other assistants serving the growing congregation included Rev. Anthony Nadolny, Rev.Michael a. Petzold, Rev. Augustine S. Kondziela, Rev. Wenceslaus A. Karp, RevMichael Urbanski, Rev. Leon Pisula, Rev. John Moskal and Rev. Joseph Zielinski. 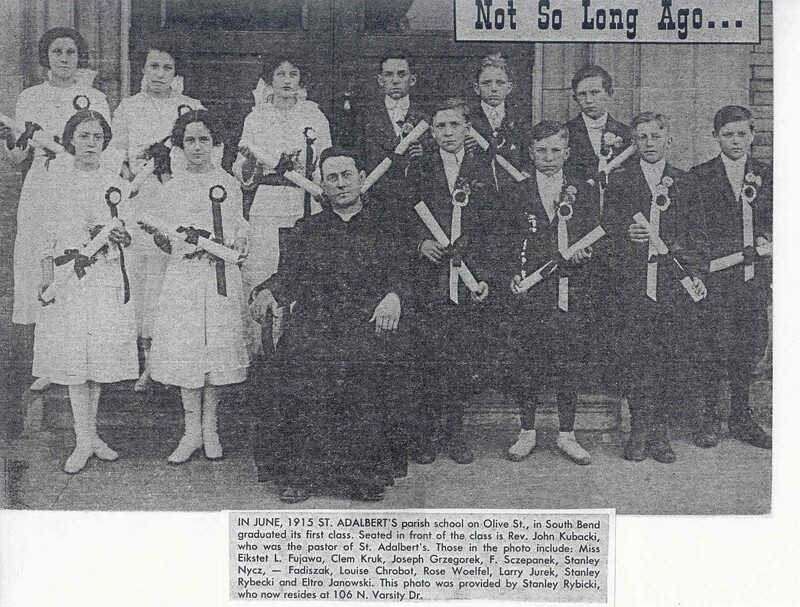 New ordinations of parishioners continued in 1931 with Rev. Clement Ewald, Rev. Casimir Moskwinski and Rev. Louis Jeziorski being consecrated as priests. Upon the death of Rev Jarka, the Rev Joseph Zielinski was appointed administrator of the parish. On January 27, 1944 Rev Ignatius Gapczynski was appointed pastor by Bishop Noll. Rev Gapczynski introduced English sermons on Sundays for the benefit of younger Poles and people of other nationalities. Many improvements were also done to the whole facility under his pastorship. 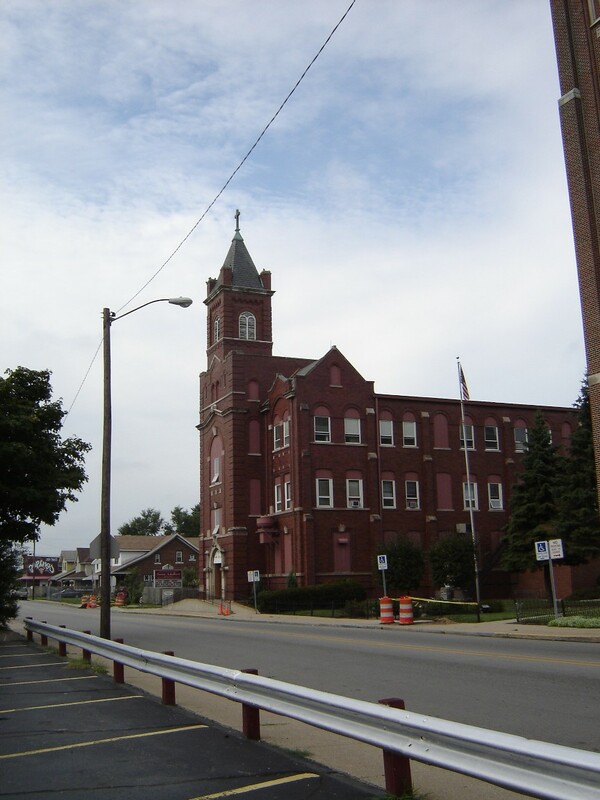 One of the most notable was the liquidation of the parish debt on February 1, 1948. By 1950 Rev. Gapczynski was elevated to the position of Monsignor. Serving the parishioners as assistants under Rev Gapczynski were Rev. John J Jakubielski, Rev. Andrew C Topor, and Rev. Thomas Depa. It was under Msgr. Gapczynski that Rev Eugene Kazmierczak served as an assistant beginning on July 4, 1951. The energies generated by Rev. Kazmierczak during those early years continue to the present ( Pastor in 1985 at the time of this document). Under Msgr, Gapczynski a new power house was added in 1957 and a new Sisters Convent in 1963. The Golden Jubilee was also celebrated in 1960. 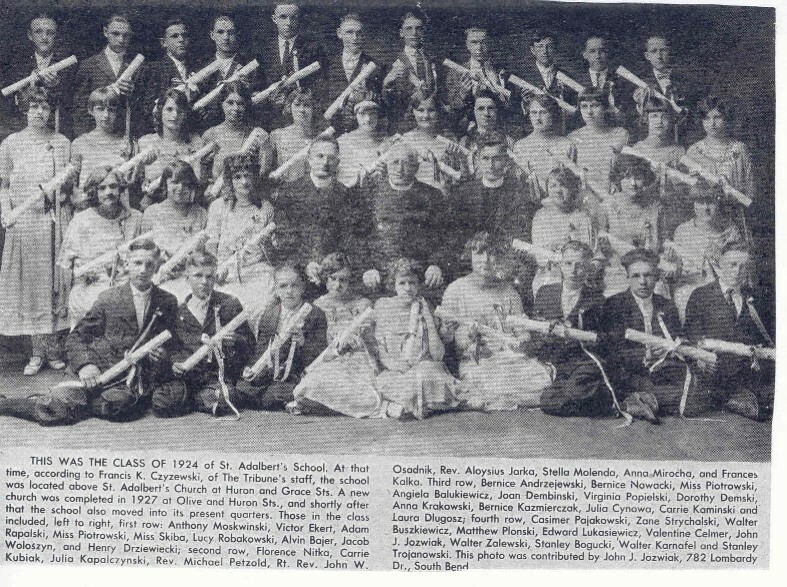 Through 75 years the school prospered with its enrollment peaking in 1929-30 at 1112 students. Graduates ordained over the years include Rev Henry Smarcz (2-2-1945), Rev William Gieranowski (6-9-1949), along with Rev Thaddeus Olszewski, Rev Matt Sienkiewicz and Rev Leonard Chrobot ordained during Msgr. Gapczynskis latter years. On July 20, 1964 the Very Rev. Ignatius Gapczynski died and Rev Kazmierczak was appointed acting pastor. Rev. John J. Moskal was appointed pastor that same year on September 1, 1966. The Rev. Kazmierczak was changed to the pastorate in Geneva, Indiana. Rev. Moskal remained pastor until 1972. Under Father Moskal, Rev. Matt Kafka and Rev Thaddeus Kwak served as assistants. On July 1, 1972 Rev Eugene J Kazmierczak was appointed the new pastor. In June of 1972 the parish Hall burned down presenting the first major challenge to the new pastor. In 1973 a Building Committee was formulated and by 1974 the hall and old sisters home was demolished. In April of 1974, the Harvest House Program was started and has become to this day a focal point for many senior citizens.